Have you ever made vegetable lasagna? No? It’s time to fix that. 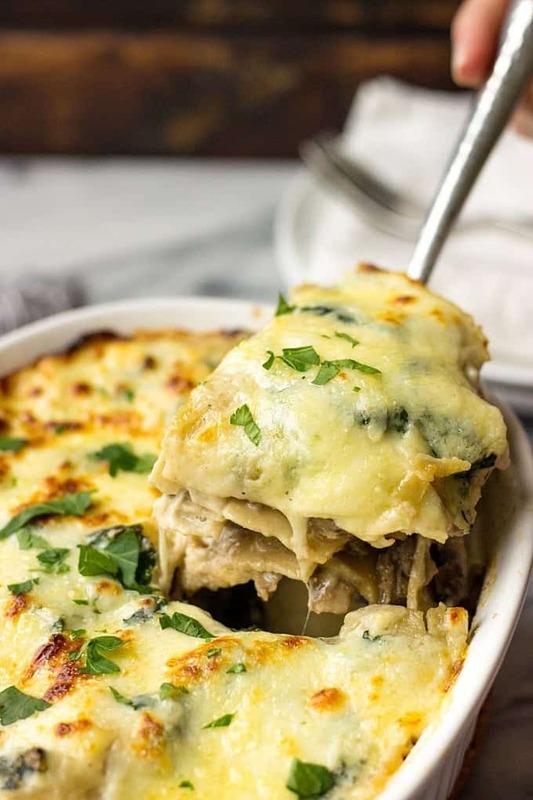 This Creamy Kale And Mushroom Lasagna is full of delicious and aromatic mushrooms, covered in a cheesy Bechamel sauce and fresh Mozzarella and baked until bubbly perfection. I don’t know about you, but lasagna has always been a comfort food to me. Just one bite and you instantly get several layers of delicious goodness onto your taste buds. That filling, that sauce, that melty cheese on top – you just can’t get enough of it, which makes you want to devour the whole thing in one sitting. Certainly, meat lasagnas are always a fool-proof choice, but how about vegetarian version? I dare you to try it. It’s mouthwatering! Despite that this particular lasagna doesn’t have meat, it’s full of mushrooms, which are a great source of protein. Go ahead and prepare this lasagna for your main course. You can certainly make a simple side salad to go with it. But even without a salad, this lasagna is a self-sufficient meal. 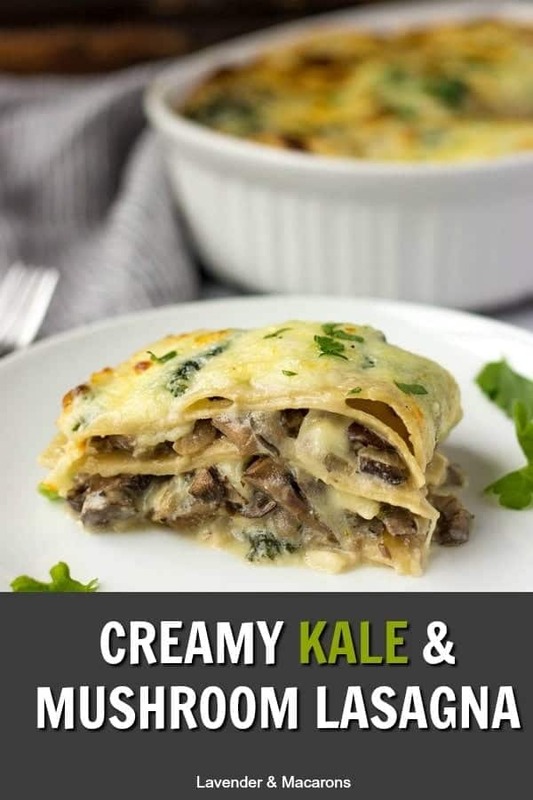 This Kale And Mushroom Lasagna can be made ahead. Just prepare the ingredients and assemble the lasagna, then cover with a foil and pop into a fridge until you ready to bake it. It ca be stored in a fridge for up to 24 hours. Heat olive oil in a large skillet and over medium heat. Add onion and sauté until translucent, about 4-5 minutes. Add garlic and sauté for 1 more minute. Add mushrooms, salt, pepper, thyme and cook until all liquid is evaporated and mushrooms are slightly browned, about 15-20 minutes. (If there is too much liquid along the way, you can carefully pour it out into a sink.). When mushrooms are cooked, set aside. Meanwhile bring a large pot of lightly salted water to a boil. Reduce the heat to medium and cook lasagna noodles for 5 minutes stirring occasionally. Drain and using tongs place lasagna noodles on a plastique covered baking sheet. Heat butter in a large non-stick skillet over medium heat. Add garlic and cook until fragrant, about 1-2 minutes. Whisk in flour and cook butter-flour mixture stirring constantly for about 4-5 minutes. Pour in about ½ cup of milk and keep whisking until no lumps remain. Add the remaining 1½ cup of milk and whisk again until the sauce is nice and smooth. Add nutmeg, salt, pepper and Gruyere cheese. Stir until cheese has melted and add kale. Wait until kale wilts and remove skillet from the heat. Take 1.5 qt (8.6 x 6.3 in) baking dish. Spread a thin layer of Bechamel sauce on the bottom of the dish. Place 2 lasagna noodles lengthwise. They can overlap. Spread a couple of tablespoons of sauce over noodles and spread half of the mushrooms. Top with Mozarella. Repeat layering process 1 more time. Finish with the final 2 lasagna noodles, Bechamel sauce and Mozarella. Cover with a foil and bake for 15 minutes. Then uncover and bake for 20 more minutes. Sprinkle with fresh parsley and enjoy! For this lasagna I chose a mix of Oyster and Cremini mushrooms. 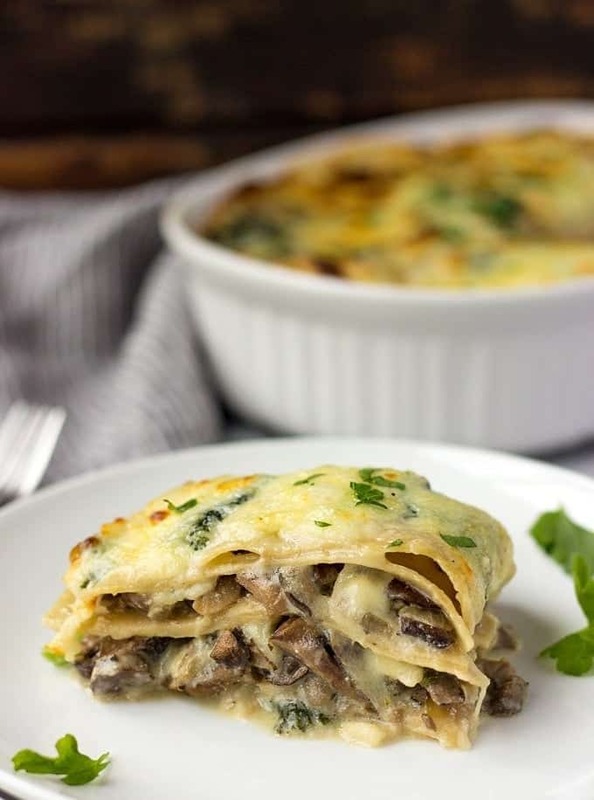 If you’ve never tried Oyster mushrooms before, they have a very earthy and woody flavor and I enjoyed a little bit of different texture in my lasagna. You can certainly go with just Cremini mushrooms, or any other types you want.